With its World Heritage Sites, friendly towns and inspiring desert landscapes, Jordan is a haven amid the turbulence of the Middle East. Situated on the east bank of the Jordan River, this is a country defined by its cultural diversity: Roman legions, Muslim armies and zealous Crusaders all passed through the land, erecting a wealth of impressive monuments along the way. The jewel in the crown of Jordan’s many antiquities, without question, is Petra; locked safe in the heart of its sandstone escarpments, this pink-hued necropolis has been captivating tourists for centuries. And you’ll soon be among them. On our Jordan holiday tours, you’ll get to discover the best of this fascinating country, including its treasure trove of ancient wonders. As well as the 'Lost City' of Petra, you’ll be able to soak up magical desert landscapes whilst uncovering sites both historic and biblical. Whether you’re looking forward to experiencing the unique waters, renowned for their buoyancy, and therapeutic qualities of the Dead Sea or you can’t wait to head to the desert of Wadi Rum, home to the nomadic Bedouin people and immortalised in the 1962 film Lawrence of Arabia, there’s something for everyone on our Jordan tours. See the Middle East in a whole new light when you visit Jordan with Travelsphere! From flights and hotels to meals and excursions, so much is included in the price of your holiday. Returning customers are rewarded with a discount – all you have to do is re-book within six months of your last holiday. You’ll have free time to explore on every holiday & you can tailor your trip too with add-ons & the chance to stay longer. Our customers give us feedback via our customer questionnaires, & we are delighted with our consistently high scores. Our 50 years of expertise sets us apart from the competition & guarantees an enriching travel experience every time. Our dedicated customer support team are here when you need them, offering 24/7 peace of mind. 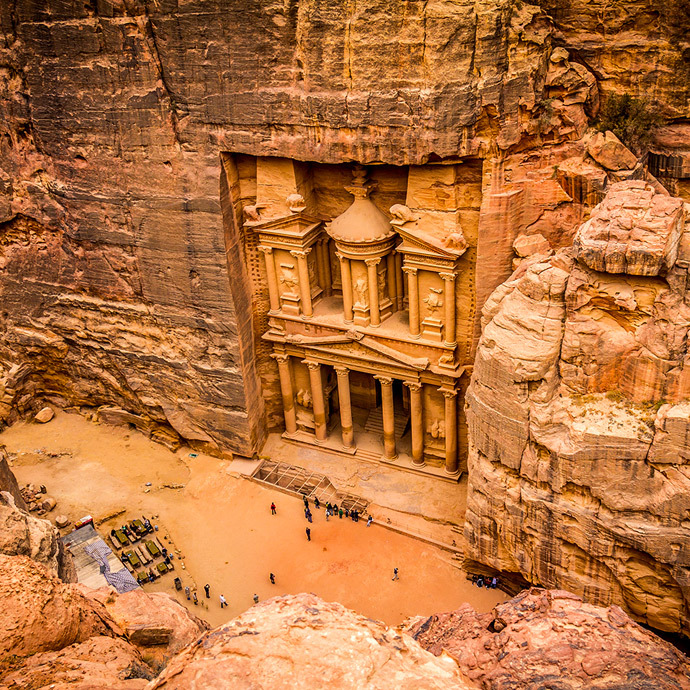 When you think of Petra, the iconic sandstone Treasury probably springs to mind – but there is so much more to this ancient city….